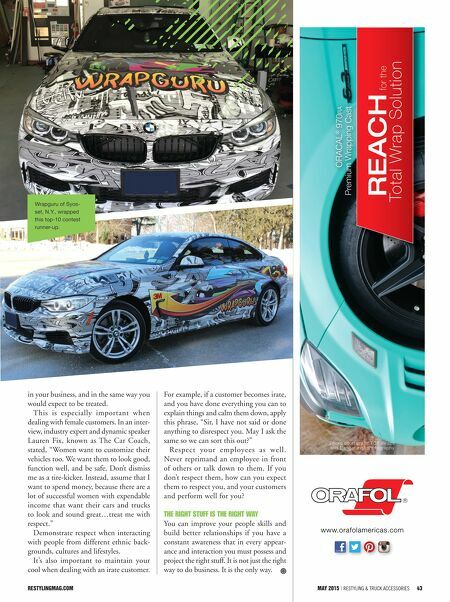 restylingmag.com May 2015 | Restyling & tRuck AccessoRies 43 in your business, and in the same way you would expect to be treated. This is especially important when dealing with female customers. In an inter- view, industry expert and dynamic speaker Lauren Fix, known as The Car Coach, stated, "Women want to customize their vehicles too. We want them to look good, function well, and be safe. Don't dismiss me as a tire-kicker. Instead, assume that I want to spend money, because there are a lot of successful women with expendable income that want their cars and trucks to look and sound great…treat me with respect." Demonstrate respect when interacting with people from different ethnic back- grounds, cultures and lifestyles. It's also important to maintain your cool when dealing with an irate customer. For example, if a customer becomes irate, and you have done everything you can to explain things and calm them down, apply this phrase, "Sir, I have not said or done anything to disrespect you. May I ask the same so we can sort this out?" Respect your employees as well. Never reprimand an employee in front of others or talk down to them. If you don't respect them, how can you expect them to respect you, and your customers and perform well for you? The RighT STuff iS The RighT Way You can improve your people skills and build better relationships if you have a constant awareness that in every appear- ance and interaction you must possess and project the right stuff. It is not just the right way to do business. It is the only way. www.orafolamericas.com ORACAL ® 970ra Premium Wrapping Cast REACH for the Total Wrap Solution Photo courtesy of Carbon Wraps Wrapguru of Syos- set, N.Y., wrapped this top-10 contest runner-up.